When horror comic specialist Scott Snyder and former Spawn artist Greg Capullo took over Batman in issue 1 of the New 52 relaunch, there was understandably a little concern amongst fans as to how the team would handle the caped crusader. After their brilliant introductory Court Of Owls arc, it was clear the icon was in good hands. As a follow-up, the duo took on The Joker and in Death Of The Family they delivered a horror movie take on the Joker/Batman relationship that was an instant classic in the annals of the endless battle between the dark knight and the clown prince of crime. Now, the duo have delivered their second Joker tale and it’s one designed to be a final battle between the most fascinating hero/villain pair in comics. 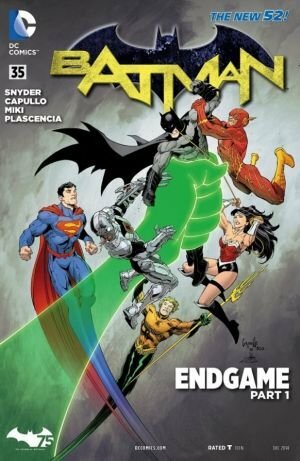 Endgame is an ambitious epic of a graphic novel that feels like a worthy concluding chapter to the Joker’s endless game with Bats. Even though it doesn’t quite match Death Of The Family, and will inevitably not actually be the final Batman/Joker showdown, it’s a hell of a tale that any Bat-fan needs to experience. Snyder conceived this second Joker tale as a direct follow-up to his first. Death Of The Family was his Joker’s sick n’ twisted love letter to Batman, an attempt by the maniacal clown to improve his beloved advisory by removing the perceived weakness of a fractured crime fighting family. In Endgame, the Joker returns with love replaced by hate. This time, the clown concedes that their relationship can never be what he wants, so he’s decided to finally launch his endgame that will destroy Batman once and for all. If he can’t have Batman, no one can, so the nihilist, anarchist, psychopath lives up to all of those titles. It’s just as wild, grandiose, and nightmarish of a plot as you’d hope from The Joker, especially when penned by the twisted genius of Snyder. The tale kicks off with The Joker poisoning Wonder Woman, The Flash, Aquaman, and Superman and sic’ing them on Batman, forcing a massive superhero battle royale in Gotham with Batman in a big ol’ Justice-League-busting battlesuit (obviously that guy had a plan to deal with the League on just such an occasion). In any other Batman tale, that might be The Joker’s entire plan, but in this one, it’s only the celebratory kick-off. 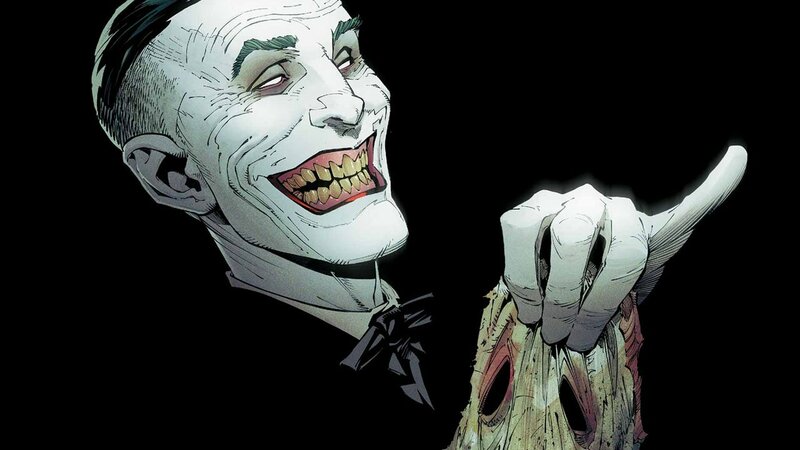 From there, The Joker unleashes a new and incurable Joker toxin on Gotham that transforms the entire city into a psychotic mob of smiling clowns determined to destroy Batman and the clown even chops of dear old Alfred’s right hand for good measure. The symbolism of those devastating attacks isn’t lost on Bats or the readers. From there, Batman and his few surviving buddies frantically attempt to find a cure to the new toxin, but discover only evidence that the Joker might in fact be an immortal figure of evil who has haunted Gotham from the very beginning. Or maybe it’s all planted evidence to increase Batman’s nightmare. It’s unclear. What is clear is that The Joker is going for broke, blowing up the entire world he shares with Bats as a fond farewell that can only end one way and shockingly does. As a final Batman/Joker story, it’s a pretty brilliant one. Snyder has proven from the beginning of his Batman tenure that he loves this world and these characters thoroughly. He understands the implications and burden of crafting a grand finale for these icons and doesn’t buckle under the pressure. His tale is loaded with symbolic and dramatic importance. It’s terrifying and on-point in its fatalism and finality. The scope is grand and the content worthy. Admittedly, Endgame’s script sags slightly in the middle as Snyder struggles to explain a potential supernatural Joker origin that’s likely just a red herring anyway. Still, a couple stumbles in this book are forgivable given the ultimate achievement. Endgame reads like an R-rated blockbuster Batman/Joker finale that could never exist outside of a comic book page. It’s loaded with such sick images, twists, and ideas to make any Batman die-hard foam at the mouth. The fact that DC allowed Snyder to end the story the way that he did is impressive. It’s a shame that the nature of the comic book industry won’t allow this ending to stick because it would have been a hell of a send-off. In fact, it would have been a good note for Snyder to end his Batman tenure on, and it’s surprising that he didn’t take that opportunity (even though selfishly, I’m glad he’s sticking around). Capullo matches Snyder beat for beat in this Batman/Joker epic. His grotesquely detailed, yet beautiful artwork has never been better. Snyder gives Capullo a full gamut of DC and Batman icons and he delivers a definitive version of them all. Together they craft some genuinely horrifying set pieces from small scares involving Joker rising up unexpectedly and/or from the dead to the massive terrifying site of a Gotham City full of rampaging Joker zombies. It’s a stunningly drawn book culminating in a final fight between Batman and The Joker that might be the best to ever grace a comic book page (certainly the final image of the foes together is an absolute stunner). Particularly when compiled into this graphic novel collection, Endgame is a feast for the eyeballs and a pleasure to consume. The publication itself lives up to the usual DC standards, featuring a hardbound cover with gorgeously glossy pages and a collection of cover art and sketches in the back for the fanboys (sadly the Joker B-story written by James Tynion that was published alongside Endgame in every issue is absent, which is a shame because it was excellent.) For Batman obsessives, there’s no denying that the book is a must own. Sure, it might not quite match the masterpiece status of Death Of The Family, but it comes damn close and admirably tackles this iconic hero/villain relationship in a different and fresh way. Snyder/Capullo clearly designed this book to be an event and not merely another story arc. They lived up to their goals and if you have even a passing fascination with the Batman/Joker relationship, Endgame combined with Death Of The Family are must reads. Snyder and Capullo have clearly made their mark on Batman and are now destined to be a part of the official Bat canon for as long as the character lives (and despite the team’s best intentions in these pages, good ol’ Bats will undoubtedly outlive us all). 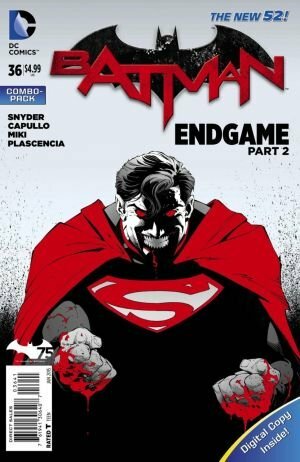 Admittedly, Endgame’s script sags slightly in the middle as Snyder struggles to explain a potential supernatural Joker origin that’s likely just a red herring anyway.